Shuswap Lake (pronounced /ˈʃuːʃwɑːp/) is a lake located in south-central British Columbia, Canada that drains via the Little River into Little Shuswap Lake. Little Shuswap Lake is the source of the South Thompson River, a branch of the Thompson River, a tributary of the Fraser River. It is at the heart of a region known as the Shuswap Country or "the Shuswap", noted for its recreational lakeshore communities including the city of Salmon Arm. The name "Shuswap" is derived from the Shuswap or Secwepemc First Nations people, the most northern of the Interior Salish peoples, whose territory includes the Shuswap. The Shuswap call themselves /ʃǝxwépmǝx/ in their own language, which is called /ʃǝxwepmǝxtʃín/, but the ethnonym’s original meaning is now lost. 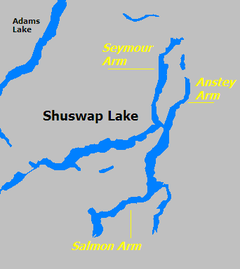 Shuswap Lake consists of four arms, forming a shape reminiscent of the letter H. The four arms are called Salmon Arm (southwest), Shuswap Arm (west), Anstey Arm (northeast), and Seymour Arm (north). Shuswap Lake connects to Little Shuswap Lake via the Little River, which flows from the end of Shuswap Lake. To the north-west it is fed by the Adams River, which drains Adams Lake. The Salmon Arm of Shuswap Lake connects to Mara Lake at the Sicamous Channel. The Shuswap River connects via Mara Lake. In the south-west the Salmon River flows into the lake at Salmon Arm. The Eagle River runs down from the Eagle Pass in the Monashees to enter the lake at Sicamous, in the east. The Seymour River empties into the northern end of the Seymour Arm. In addition to these rivers, numerous creeks feed the lake, including Scotch Creek, which runs south to the north shore of the main arm, near the community of the same name. Shuswap Lake is home to at least fourteen species of fish. Of these species, the Chinook salmon, Coho salmon, Sockeye salmon, Rainbow trout, Lake trout, and Burbot are of importance regarding recreational fishing. Eurasian water milfoil has spread across much of the lake, but is most prevalent in Salmon Arm Bay. Carp may also be present. The central interior plateau of British Columbia drained by the Fraser and Okanagan rivers is part of the Shuswap terrane in British Columbia and northern Washington state. It is dissected by numerous elongated, glacially-overdeepened lake basins which are formed by the same mechanisms as coastal fjords. Like many other lakes, Shuswap Lake has a local lake monster legend attached to it. A 25-foot long serpentine creature, known as the Shuswap Lake Monster or "Shuswaggi", is reported to live in the lake. ^ William J. Poser. "The Names of the First Nations Languages of British Columbia" (PDF). Billposer.org. Retrieved 21 May 2018. ^ Communications, Government of Canada, Fisheries and Oceans Canada,; Communications, Gouvernement du Canada, Pêches et Océans Canada,. "Fisheries and Oceans Canada". www.dfo-mpo.gc.ca. Retrieved 2017-01-07. ^ "Aquatic Invasive Species « Columbia Shuswap Invasive Species Society". columbiashuswapinvasives.org. Retrieved 2017-01-07. ^ Shuker, Karl, P.N. (1997). From Flying Toads To Snakes With Wings. St. Paul, Minnesota: Llewellyn. p. 222. ISBN 1-56718-673-4. Cooperman, Jim (2017). Everything Shuswap. Salmon Arm, BC. ISBN 9780995052208. OCLC 973043687. "Shuswap Lake". BC Geographical Names. Wikimedia Commons has media related to Shuswap Lake.